Her mother never met a crossword puzzle she couldn’t solve. After her death, the author continues the tradition, making more headway on Mondays than on Saturdays. On a recent Sunday morning I sat at the kitchen table in my fluffy white bathrobe, sipping a cup of hazelnut coffee and tapping one polished red fingernail against a wooden pencil. The New York Times crossword puzzle was spread out before me, and as I searched my brain for a four letter word meaning “gradually give up” a realization struck me. My mother never met a crossword puzzle she couldn’t solve. She did the New York Times puzzle every day, scoffing at Mondays which were so easy she found them personally insulting (“You call this a puzzle?”) and delighting in the challenge of a Saturday puzzle which might take all afternoon. My mother was many things, but she was not a quitter. (When asked the secret to the success of her 63-year marriage she gave a one-word answer: perseverance.) Every time my mother finished the puzzle — and she always finished the puzzle — she crowed “Ta-dah!” cast the paper aside, and slapped her pencil down on the coffee table with a loud, triumphant smack. When did my mother start doing the crossword puzzle? When she was a high school student? A sales clerk at Orbach’s? A young bride? A new mother? I’ll never know. That’s one of the many things I never got to ask her. When the Sunday papers were delivered to my childhood home back in the day before pieces of the Times arrived on Saturday, it was cause for celebration. Sections were passed out like presents: my father handed the Sports section to my older brother, gave me the Book Review, offered the funnies from Newsday to my younger brother, put aside the Business Section for himself, and bowing like an English butler, presented the magazine to my mother. She would be sitting in the den dressed in her fuzzy green housecoat with a cup of instant Maxwell House coffee in a mug marked “The Boss” steaming to her left and a nonfiltered Chesterfield King cigarette in an ashtray shaped like an upturned palm smoldering to her right. Once she had the magazine in hand, she put down her half-eaten bagel, picked up a newly sharpened pencil, and began filling in the little white squares. The room was silent except for the occasional turning of a page like a sigh, and the click-click-click of the tip of my mother’s red-polished nail tapping the side of her number two pencil, which she said helped her think. “You are correct,” my mother said, and filled the letters in. My mother shut her eyes again and I could see that she was counting letters in he head. “Spineless,” she declared with confidence, already knowing she was right. As my mother grew weaker and our trips to the hospital became more frequent, I began to measure her state of being by how well she did the puzzle. If she couldn’t tell what a trypanophobe fears (“needles”) I knew she was having a bad day. If she couldn’t tell me an eight-letter word meaning short-lived (“fleeting”) I knew she was having a very bad day. And if she told me to just do the puzzle myself, it was all I could do to not break down completely. But being a good daughter, I did what my mother told me, struggling to think of a seven-letter word for depart (“abandon”), a six-letter word for radiologist (“imager”); a five-letter word that meant be overwhelmed (“drown”). Sometimes the clues were downright scary: Where to find some very sick individuals (“ICU”). Sign between Gemini and Leo (“Cancer”). Waif (“orphan”). Trounced (“defeated”). End (“finis”). I glanced at the magazine section but couldn’t even bring myself to open it. “I can’t,” I said. “But I’m not as smart as she is.” I couldn’t bear to speak of my mother in the past tense. And now it is THREE years later and I am still trying. I am sitting in my own kitchen, with the puzzle spread out before me. My coffee has grown cold. My pencil has grown dull. My leopard-print glasses have slid down my nose. “Gradually give up,” I read the clue to 34-across aloud. Tap tap tap goes my red nail against the wooden pencil. “Wean!” It comes to me in a flash and as I fill in the letters, I hear my mother’s voice in my head say, “Good girl.” I put my pencil down and stare out the window. “Mom, where are you?” I whisper. “I don’t know how to do this.” By “this” I don’t mean the puzzle. I can struggle through the puzzle. I’m getting better. Like my mother, I now consider Monday crosswords an insult, though I still don’t make much headway on Fridays or Saturdays. No, what I can’t puzzle out is how to be a motherless daughter. How in the world am I supposed to live the rest of my life without my mom? Leslea, what a beautiful essay. I LOVED the puzzle metaphor and attempting to put the puzzle pieces of our lives back together again after we have experienced a deep, profound and life-altering loss. Thank you for sharing such raw and touching moments with your mom with the crossword between you. Sending much love! As always, so moving, Leslea. Your mom’s very much with you & will always be. I’m going to be that Mom – only I do the puzzle in ink!! Wonderful story. This is wonderful, Leslea. My mom and dad did the NYT Sunday puzzle, until my dad died. Later, my mom and I or another of my siblings did the Merl Reagle puzzle with our mom. Merl and I began a correspondence about my mom. My brother reminded me, after Merl’s death that mom had also corresponded with him…once to let him know he had gone out of his mind. The answer to the clue “Canine leader of the free world” was Pooches pooches collie. “That man is off his rocker,” my mom told my brother. He reminded me of that story years and years after she wrote to Merl. 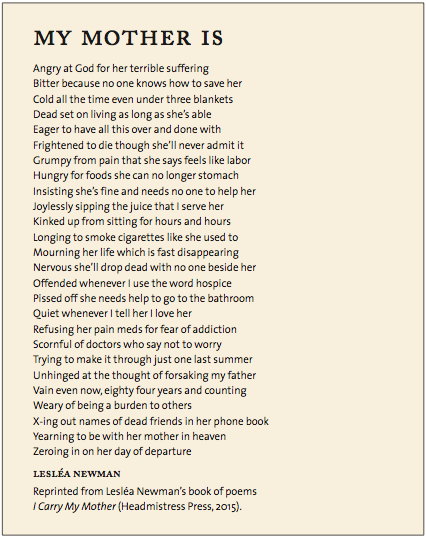 I love the way you weave the language of dying and grief and crosswords together. Your essay is beautiful.